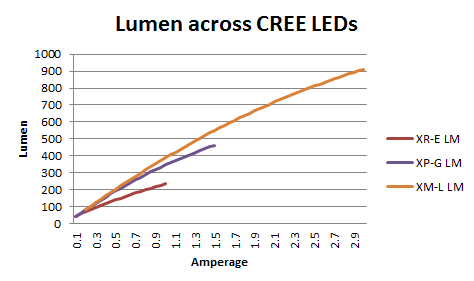 As you can see from the above graph, as more amperage is used, there is less and less light given out by the older CREE models. The XR-E Q5 at 1 amp puts out only 67% of what the XP-G CW would at 1amp and only 60% of what the XM-L CW. That means you have to use almost twice the number of XR-E CW to match an XM-L cool white. This is not taking into consideration how much voltage you have to pump into that little XR-E just to get 60% of the XM-L light which is show below. 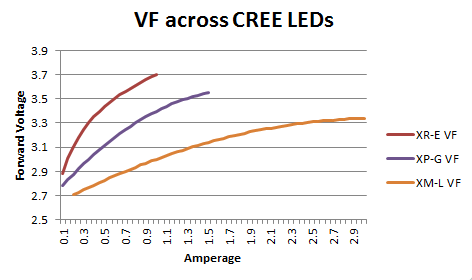 You can tell quickly by the graph as the amperage goes up, the XR-E uses much more voltage than the XP-G and XM-L. At 1 amp, the XR-E uses 3.7v which is 10% more than the XP-G and a whopping 23% more than the XM-L. That means if you have a 48V driver running at 1mp you can only put 12 XR-E CW or 14 XP-G CW or 16 XM-L CW. That means for the same cost of powering 12 XR-E CW which give you 2824.8 lumen you could be powering 16 XM-L CW which would give you 6208 lumens. See how quickly this adds up? Less power, more light, that is what LEDs are all about. This is why efficiency is so important. Every minute you have a non efficient LED wired up, it is costing you money.